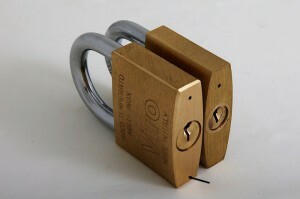 When you have to buy a padlock in a shop, or worse still in a department store, where it is harder to get advice, it is often difficult to assess the difference between one lock and another. When they are of the same type and dimensions they all seem alike at first glance. The price makes a difference, but even in this respect the difference between a good padlock and a poor one is not so great. 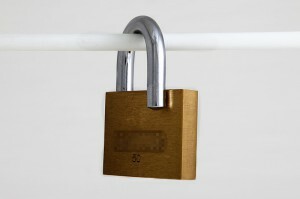 So there is a high risk of buying an unreliable padlock. 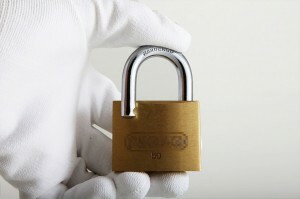 An unreliable padlock doesn’t just mean one that is easy to open, but also one that may soon be blocked or jammed, especially when used outdoors. 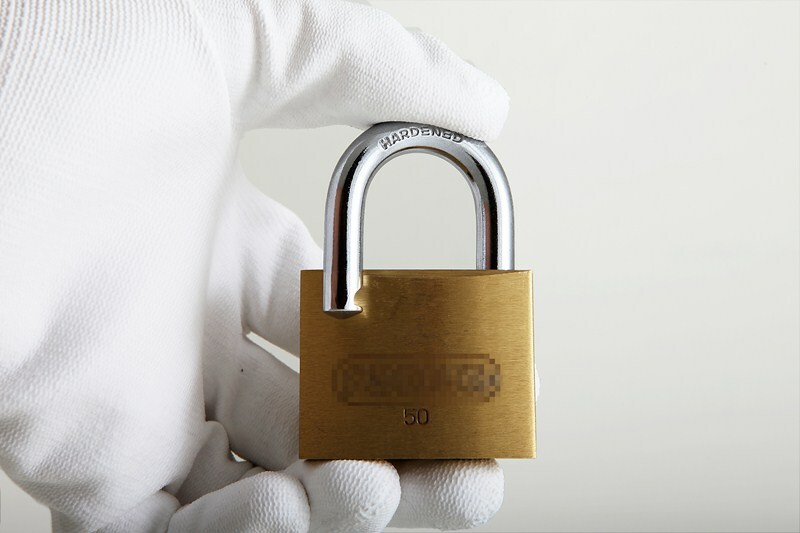 This means it is a padlock which instead of being useful and avoiding problems actually creates new ones. Let’s look at a comparison of the differences between two 50 mm rectangular padlocks: a Viro one, made in Italy, and one imported from the Far East. 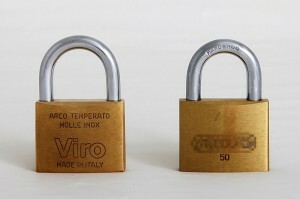 A 50 mm Viro rectangular padlock, made in Italy, compared with a similar one imported from the Far East. 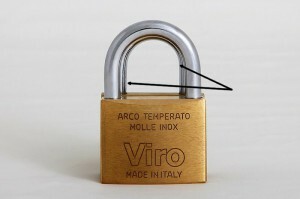 The body of the Viro padlock (black arrow) is larger. 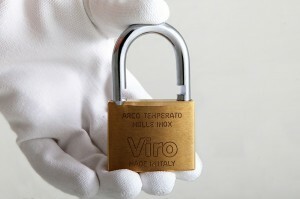 The shackle of the Viro padlock is larger. 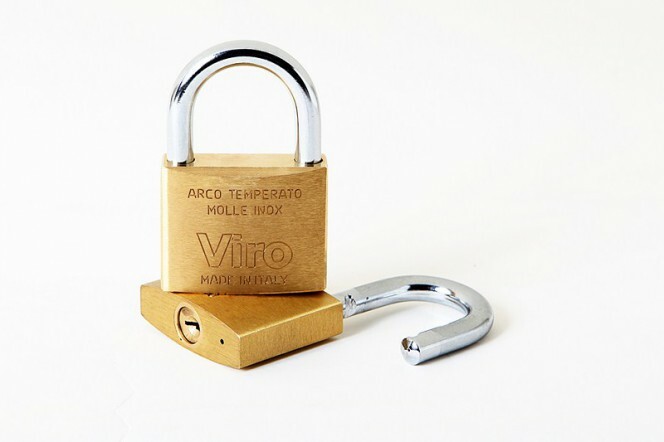 The Viro plug is the correct size for its body, whilst the size of the plug for the other one is smaller than that which would actually be required for that particular body, so much so that it is fitted using an adapter. 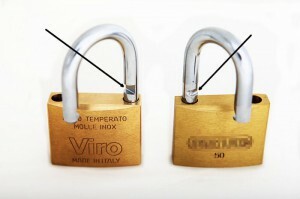 On the plug of the imported padlock there are clearly traces of oil/grease; this is a sign that, because of imprecise machining, the internal mechanisms required a generous lubrication in order to work properly – but when the lubrication is reduced after a few uses there are most likely to be malfunctions. The left arrow points to traces of lubricant, while the right arrow points to a plug adapter. Even the keys give us some clues: the Viro key is free of imperfections, which is a sign of accurate machining, whilst the other key has evident bumps in the milling, which is a clear indication that it was produced with poor quality equipment. 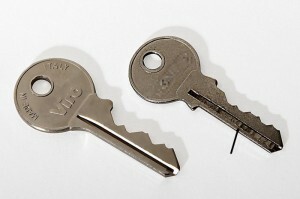 The Viro key has no imperfections, whilst the other one (black arrow) has. 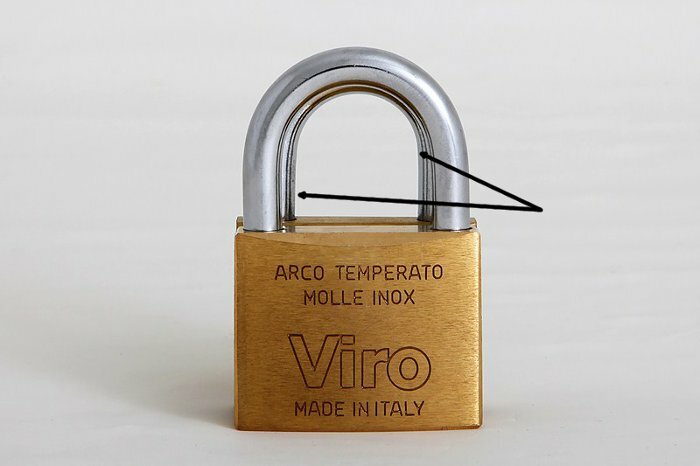 The Viro padlock does not close if the shackle is not in the correct position. 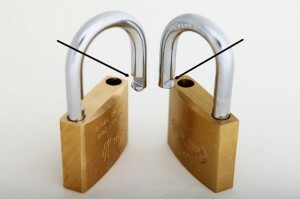 Also out of position the shackle remains seemingly closed; it is actually only necessary to pull the body to open it. 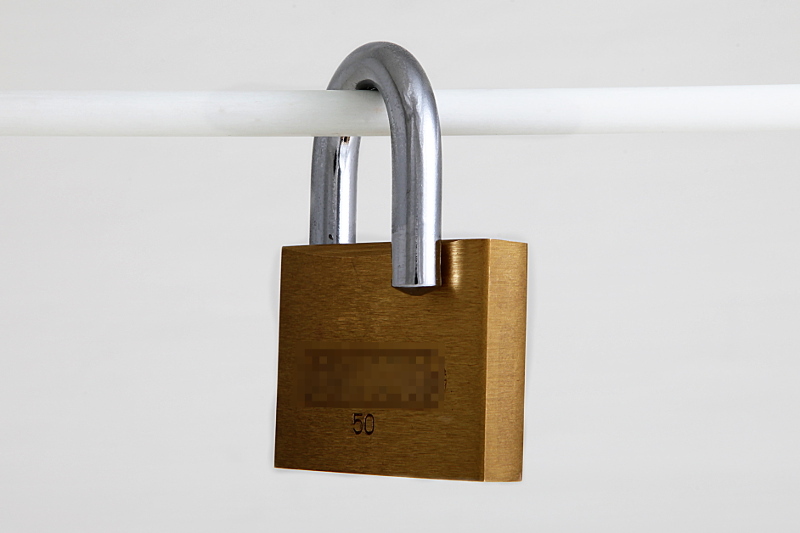 Besides being a sign of poor precision of the internal mechanisms, this behaviour is very dangerous, because if the lock is closed carelessly in this way one is convinced of having closed it, whereas in fact the body only needs to be pulled for it to open. 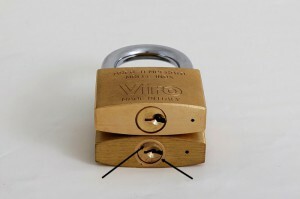 There are differences between a good padlock, which is secure and reliable, and a poor quality one, and if you know where to look for them are easy to see at a glance. 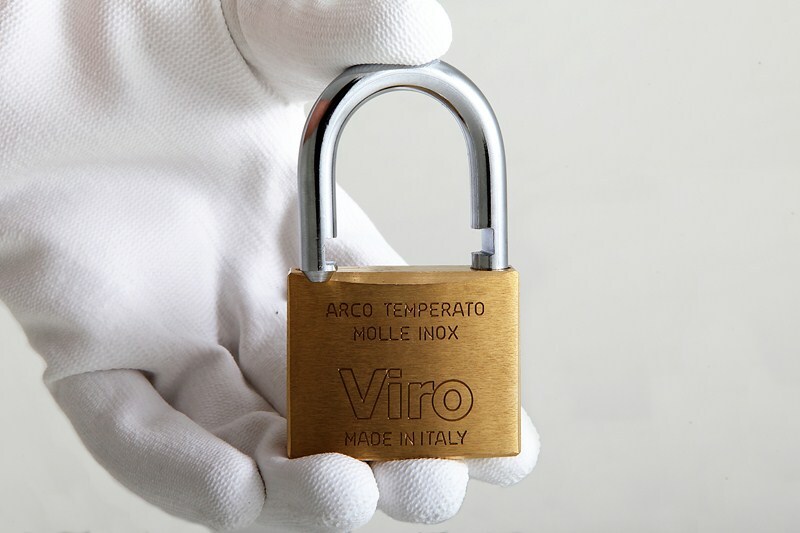 It is precisely this higher quality which allows all the Viro padlocks made in Italy to be guaranteed for 5 years from date of manufacture. The Viro padlocks made in Italy are guaranteed for 5 years from date of manufacture (marked on the key). This entry was posted in Padlocks and tagged tips on 19 September 2013 by Mara Rossi.